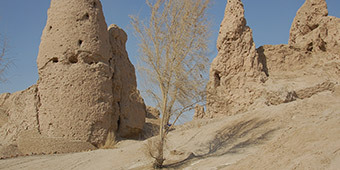 The northernmost region of Turkmenistan with its fertile riverine oases, has been populated since ancient times. The UNESCO World Heritage site of Kunya Urgench is the best-known of various historical sites that reflect this, not the least because it was the capital of the Khorezmian Empire. Also today, the region remains a logical gateway to neighboring Uzbekistan, with two entry points, one leading directly to Nukus from present-day Kunya Urgench town, and the other one from the regional’s capital Dashoguz to Khiva. Agricultural production is crucial for the region, and most rice for Turkmenistan’s consumption is grown here. When traveling south, you enter a vast area of lowlands, ravines, salt plains and lakes and remnants of the dried-up riverbed of the ancient Uzboy River, and the ever-present Karakum Desert. 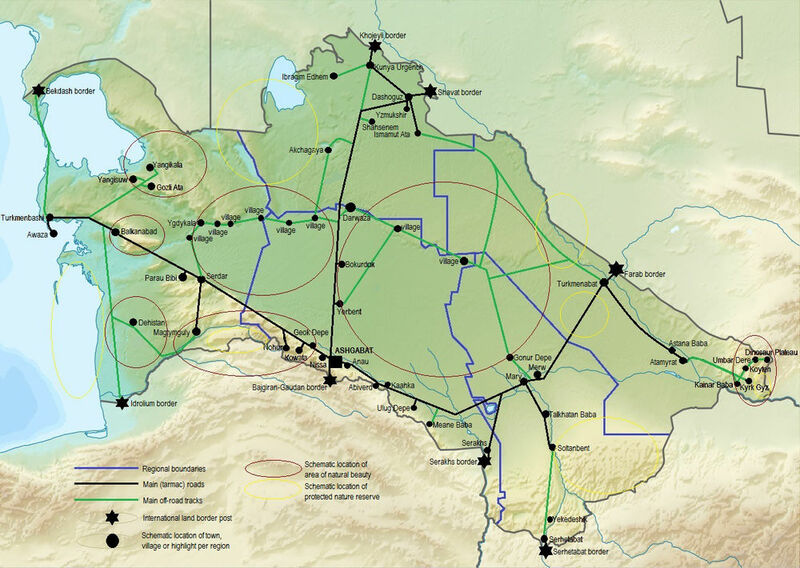 When traveling east towards the point where the famous Amu Darya River exits Turkmenistan, you follow ancient caravan routes that lead to Amul (present-day Turkmenabad) or Merw (present day Mary). Kunya Urgench owes its UNESCO World Heritage status to the fact that it was an important Silk Road hub on the Oxus River, and capital of the Khorezm Empire (12th c AD), until its destruction by the armies of Dzhengis Khan. Several mausoleums, town wall remains, the tallest minaret in Central Asia and the Kyrk Molla pilgrim mount reflect the various roles of this historical city, which was praised by historical figures such as Biruni and Avicenna, Al-Farabi and Al-Khorezmi. The minaret, the construction of which started in 800 and was completed in 1320, is located south-east of Kyrk Molla. 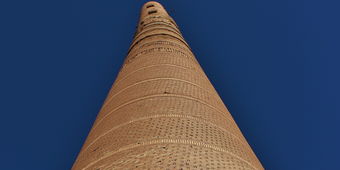 The tallest minaret in Central Asia is 15 m higher than Bukhara’s Kalyan minaret. The upper part of the minaret leans 1,5 m to the west. Today the minaret is 64m high, and is named after the Mongolian governor of Kunya Urgench, Kutlug Timur, a powerful emir of the Golden Horde. 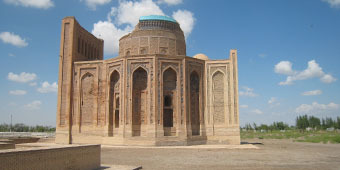 The oldest mausoleum on the territory of Kunya Urgench is the mausoleum of Khorezm shah Il Arslan. 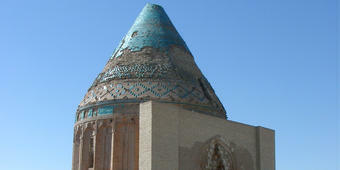 Its most striking feature is the Khorezmian conical dome. On the main façade is a un-outspoken entrance portal. However, three separated niches above the main entrance are beautifully decorated with terra-cotta stucco decorations, representing floral designs. Il Arslan was the shah of Khorezm from 1156 till 1172. 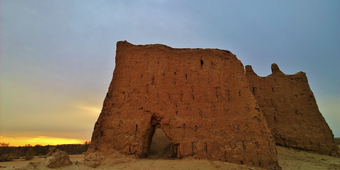 The next door mausoleum is the mausoleum of Soltan Tekesh, who was the shah of the Khorezm Empire from 1172 till 1200. The mausoleum’s construction is notable for its remarkable blue glazed decorated conical dome and rather high and intricately decorated entrance portal with stalactite design. The mausoleum has a square base, with walls of 11,5 m in length. 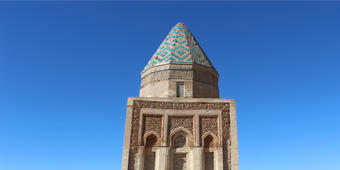 The spectacular mausoleum of Turabek Khanym is located near the Kutlug Timur minaret. She was a daughter of the Golden Horde ruler Uzbek Khan, under whose reign its power reached its peak. The double-domed construction was constructed in 1370, and remains in excellent state till this day. The interior has impressive stalactite majolica decorations were employed to decorate the arch of the portal and the entrance hall ceilings. The mausoleum, with its beautifully aquamarine majolica portal decorations, holds the tomb of Najmiddin Kubra (1145-1221), a renowned Sufi leader and founder of the Kubra order. Directly opposite is the mausoleum of Khorezmshah Sultan Ali (XV! c.), the design of which is considered a poor copy of the Turabek Khanym mausoleum built two centuries earlier. The remains of the fortified northern walls of a citadel (?VI c BC – III c AD) are located just opposite the Tekesh mausoleum. 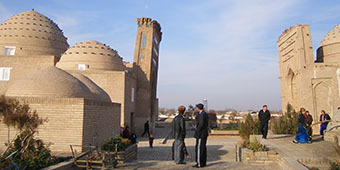 The popular name of the citadel is Kyrk Molla (forty mullahs). The citadel is perhaps the oldest part of Kunya Urgench. The earliest ceramics discovered here date back to V c. BC. 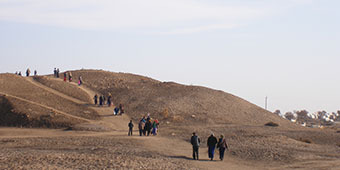 The mount covering the rest of the citadel, has become a cemetery, where local pilgrims perform an unusual prayer ritual. The portal of this building of unknown purpose (?XIV c.) is one of the few monuments preserved on the territory of Dash Gala. The common explanation is that it was the entrance to a caravanserai. The portal bay has been beautifully decorated with blue and white majolica, representing floral and geometrical designers. The external side of the arch is decorated with cut brick ornaments. The gates, towers, enormous moat and well-preserved 25-meter high walls that stretch for some 1500 m, remain an impressive sight. Next to the fortress is a mausoleum, allegedly of a famous medieval philosopher Abu az-Zamakhshari, and therefore Yzmukshir is also known as Zamakshar. Diyarbakir (IV c. B.C/III c. A.D., X-XIII cc., XIV c.) is an ancient and medieval urban site about 90 km to the west of Dashoguz. It represents a rectangle (250x200 m) in plan surrounded with the walls having an inner fire corridor and semi-oval towers. 700 m eastwards from the site are the remains of an interesting object, supposedly a caravanserai and bazaar from the period of the Khorezm Empire. It is square in plan (200x200 m) and consists of four courtyards encircled with rooms and iwans. By size Diyarbakir reminds of nearby Shahsenem. 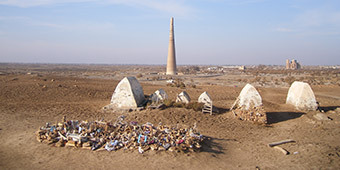 Shahsenem is a urban site is situated 90 km to the north-west of Kunya Urgench. It represents a polygonal hill, towering almost 9 m high above the locality, originating from the period of the Kushan Empire. The fortified medieval town (aka Suvburun) was surrounded by double-row walls with arrow-shaped embrasures and semi-circular towers. 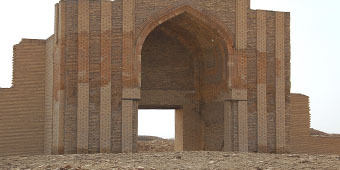 In the center the ruins of a large mosque of the time of the Khorezm Empire have been preserved. Outside the town wall, a vast garden complex charbag (XII-early XIII cc.) was located. Devkesen, 60 km west of Kunya Urgench, towers high above the 30-m precipice of the Ustyurt Plateau. It is crowned with an earthen citadel with goffered walls. Due to its location in a border area, the site is currently off-limits to visitors. Devkesen represents the huge rectangle (250x220 m) of stone walls with numerous towers. At the foot of "the upper town" is a second rectangle of a walled "lower town". During the Golden Horde, a cult complex was formed, of which 3 nameless mausoleums and a mosque of fired brick and stone survived.